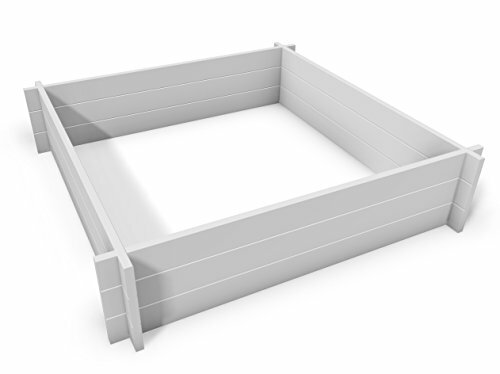 Not only does the New England Arbors Hudson 4 x 4 Modular raised garden bed look great with your landscaping, it also makes growing vegetables, herbs, and flowers a breeze. It's no secret, raised garden beds transform your yard to a beautiful landscaped refuge in a flash. With this raised garden bed there's no need to till or spend time creating a garden space, you can easily add a manicured, finished garden anywhere. It minimizes weeding, reduces pests, and has style to spare. This garden bed comes with easy to follow instructions and assembly takes only a few minutes. Dimensions: 48L x 48W x 11H in.. Made from premium high-grade vinyl. Fresh white finish. Durable and maintenance-free. Designed for outdoor use. Guaranteed not to rot, crack, warp, peel or turn yellow for 20 years.